Building up your Prestige. Almost non-stop progress. There are no levels here and no level cap, no tangible mark where you character progress ends (besides weekly caps, but they are not that restrictive as they seem to be). This games provides you with ability to keep improving your character week by week. Let me tell you how to use this opportunity for your benefit. if you are playing casually then, you should probably not bother yourself too much about it. But if you want to reach the Distortion raids first and make first server kills with your Pantheon, then you should definitely go for it. Anyway, it’s also a description of what you can do after you reach your weekly caps. First of all I’ll tell you about Prestige. It’s the overall power of your character, that shows how much he developed. Buying new nodes in Class and Ascension (and Divine) atlasses. Equipping gear with a higher prestige bonus (and Proficiency requirement). Upgrading your weapon, offhand and jewelery slots. Upgrading Obelisks in your Pantheon (really minor increase really.. don’t bother too much about them). There are not-so obvious thing about Prestige. There are your real Maximum Prestige value , and your current Prestige. It’s your Maximum Prestige value that serves as your access level to new game content. You might have noticed that when you switch classes or change gear your Prestige is going down – it’s your current Prestige (lower left part of the screen), not Maximum Prestige. So far, only place where you can see your Maximum Prestige value is in your Pantheon members list, i know, it’s pretty confusing. The game remembers your best value of prestige when you switch to the class with most node, put up the gear with highest prestige (even if it have useless bonuses, you can switch them back to useful after that) , and select highest quality shrines. Do this from time to time to increase your Maximum Prestige value. Basically is the core idea of character progression in Skyforge. And here how it works. Each node you buy gives you a small amount of Prestige, but also, depending of type of the node, it gives you small bonus to some stat or stats. Red nodes gives you Might and Proficiency. Green nodes gives Endurance and Proficiency. Blue Node of Greatness gives you Greatness. Every piece of gear (weapons, offhands, amulets and rings) have a Proficiency requirements to equip them. So the more Proficiency you have – the more powerful gear you can quip,which also increases you Prestige, that allows you to get access to higher difficulty levels of adventures, and new adventures, where you find even more powerful gear, that gives you more Prestige while requiring even more Proficiency to equip it. Is one of the requirements to upgrade temples or your Order. Nothing more, nothing less, but extremely important to have if you want to squeeze as much as you can from your potential to get even more powerful. In a nutshell it’s a mini game (which you will be able to play from game portal at some point), that allows you to significantly improve your character. Though it’s not so obvious at the start. The rank of your Order is one of the requirements to upgrade your temples. And your Adept’s quality is a requirement to use a shrines of the same quality to full extent. I’ll explain how the Order works later in this guide. Doing red mission in the Order provides you with Gifts – another requirement to upgrade your temples. What is the big deal about the temples? Why they a require so much? Second of all – temples are really the Big Deal. At my ~110000 Prestige on RU OBT they provide me with 20600 Prestige, along with a huge bonuses to Might, Endurance and +88% Bonus Health. Yes it’s their purpose – to give you a huge increase in Might and Endurance, as well as provide you with bonus health (+88% at lvl 26 of each temple). Now you might be interested in them? Here is one more thing – why you should upgrade them – if you don’t upgrade them, then your Proficiency will allow you to equip the gear, that you can’t get yet, since your Prestige is too low to get access to the difficulty levels of adventures and new adventures that allows you to get gear with a higher Proficiency requirements and a Higher Prestige….. Well you know the drill already. Without upgrading the temples you will not be able to use your Proficiency for it’s full potential. Without upgrading the temple you will have a Lot less health than the characters with a same prestige but with upgraded temples. Not a big deal you say? But what if it’s your opponent in PVP? So. Temples. Big Deal. Upgrade them. Expensive, Totally worth it! it’s rather a good plan to upgrade all three of them equally, to some point in your progress where Might and Endurance starts to lose their usefulness to you StrengthValorLuckSpirit becomes your key concerns, since they will become the most important part of your DPS and DPS of your group DD classes you are playing support classes, since you provide your party with 20% your StrengthValorLuckSpirit passively, and can increase those stats with direct buffs). Besides providing the bonuses, upgrading this slots also provides you with a Prestige ( but not too much). That covers all the bases (i hope). Now let me tell you about your Order. The starting point and key part of your Order is your Adepts. They come in a different profession, each profession comes with it’s set of 2 stats, and each profession are more suitable for specific missions, they also comes in different quality and level. Profession qualifies the Adept to do specific mission with a higher success chance. Stats provides bonuses to time, difficulty level and rewards from Order missions. Level provides bonus to success chance. 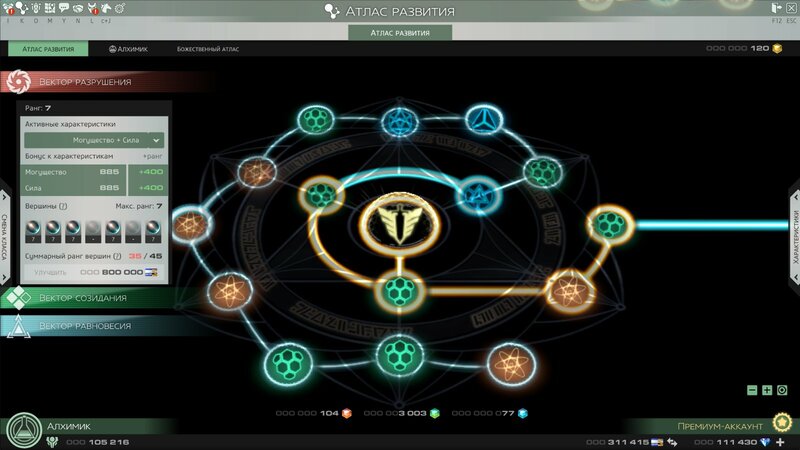 Quality of Adept can be improved via Enlightenment process with special medallions (of the grades) which you can get as reward for adventures. This process also requires profession-specific resources that you can get from “blue” missions. Level of Adept can be improved by sending him to do missions. The starting goal is to have at least one Adept of each profession, and at some point (at high rank of the Order) you want to have 2 of each profession. Each day, early at the morning you will get a selection of potential candidates to become your Adepts. At the early ranks of your Order your priorities in selecting the Adepts should be: Profession>Stat’s values>Level>Quality. But if you see an Adept with stats 4/4 or higher – forget the profession – grab him now! At the higher ranks of the Order switch priorities to Stats>Nothing else matters. Since you will have all slots filled with Adepts and you simply want to have the best of the best of each profession. Quality and level you can improve over time, but stats of Adepts is the thing you can’t improve. Blue missions for spending Supplies will bring you Followers and enlightenment resources. Red missions for spending supplies will bring you Gifts. Violet missions (available only during Invasions) will provide you with Faith, Gifts and Followers. Dark Blue mission will provide you with construction materials for Pantheon, or with energy modules for research. If you are in the Pantheon and it’ have an Operation’s HQ built, then you can buy consumables to improve rewards from missions or to increase chances to succeed in doing them. More followers – higher the rank. Higher the rank – higher level cap of Adepts. Higher the ranks – higher the level cap for Temples. if you read this guide from the start – you will realise why you should play “Orderville” minigame. And now key part of this evening show! What to do when i hit my weekly cap? Farm for a higher Prestige gear, to be able to farm better prestige gear, to be able to farm better Prestige gear…. it’s might be very time consuming. Especially when you start farming for epic rings. Check the map in Divine Observatory every few days for a Relics to upgrade your Order shrines. If you are not playing alone – then play with your friends, or help your pantheon members. Play PVP. Though it’s rewards does not matter much when you hit weekly caps, the PVP gameplay is reward in itself (provided you enjoy it). Here how the new Cores system works in RU OBT. 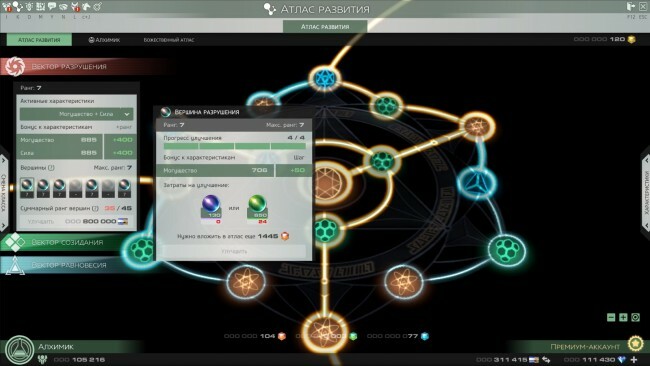 Either Cores in atlas changed into Nodes of Destruction, Balance, Creation. Opening one in atlas allows you be able to upgrade one of your Vectors. You have 3 Vectors: Destruction, Creation, Balance. Each Vector have 7 slots for Nodes. And each slot can be upgraded with either Advanced Either Cores (bought with argents) or regular universal Either Cores (dropped in open zones, Anomalies and PVP reward bags). Upgrading the Nodes to a certain sum of levels allows you to upgrade the Vector. Upgrades of the nodes a limited by overall number of relevant colored sparks spent. In each Vector you can choose what Stats it’s increases and it’s awesomely useful! For Vector of Destruction it’s Might + Strength (or + Valor, or + Luck , or + Spirit). Upgrading the nodes will increase Might bonus. For Vector of Creation it’s Endurance + same selection of stats. Upgrading the nodes will increase your Endurance bonus. This system allows to get a HUGE and useful bonuses to stats. No Argents is required for it. But it will cost you a truckload of credits to upgrade :) And also will give a LOT of Prestige.